At ACE, we offer products keeping pace with evolving technologies to make coil winding processes easy and quick. 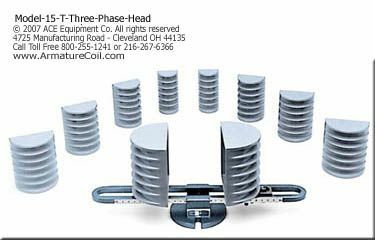 Our range of three phase coil winding heads is extremely useful in winding coils without any sharp corners. Available in model no 15-T, this innovative unit is smartly designed and ruggedly engineered for demanding coil winding applications. 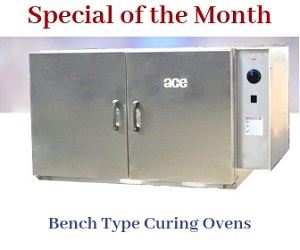 ACE offers three phase coil winding heads in sets. 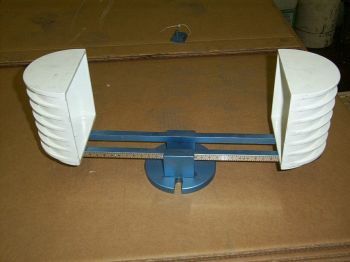 The unit comes with a 19" holder, and 5 sets of forms. We also offer additional forms upon request. Moreover, a 25" holder is also available for specialized winding applications. We at ACE makes sure that our customers possess a clear understanding of the operation procedures of the 15-T winding head. We provide adequate technical assistance to customers, helping them use the unit in the right manner. Similar to the single phase winding head, the mode of operation of the three phase winding head is simple. Follow the steps below to wind coils effectively. Measure the length of the insulated slot of the winding head, as well as the width of the coil to be wound. Place the selected winding head form on the holder. Now, you are ready to wind. This versatile and innovative unit is engineered with the following specifications.